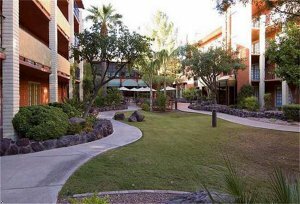 The Embassy Suites Phoenix hotel is located 1.5 miles from the Phoenix Sky Harbor International Airport at 44th Street and is minutes from downtown Phoenix, the city of Tempe, Old Town Scottsdale and the prestigious Phoenix Biltmore area. This full-service upscale all-suite hotel is a short drive from the Arizona Center, the Phoenix Civic Plaza Convention Center, the Phoenix Zoo & Desert Botanical Gardens, Arizona State University (ASU), Chase Field - home of the Arizona Diamondbacks, US Airways Center - home of the Phoenix Suns, the Phoenix Art Museum, Tempe Diablo Stadium, the Biltmore Fashion Square, the Scottsdale Fashion Square, and Sun Devil Stadium. Guests at the Embassy Suites Phoenix hotel by the Phoenix International Airport at 44th street stay in spacious two-room suites and receive a complimentary cooked-to-order breakfast, high-speed internet access and a nightly manager's reception.